Construction to Start in Spring, 2018. Julie G’Vitale of Dynamic Assisted Living Brokerage in Cape Coral wrote West Delray Update during early 2018. The construction will start in the spring. The company hopes to finish the building enclosure before the end of the year. The total number of units will be 130, broken down as 76 Assisted Living and 54 Memory Care. More than likely, the building will be licensed for 140-145 beds to allow married couple to reside in the same unit. On August 25th, the proposed congregate care (assisted living) facility at Lake Ida Road and Via Flora was approved by the Palm Beach County Commission. RECOMMENDED IMPROVEMENTS ACCEPTED: See Slide Show Above. 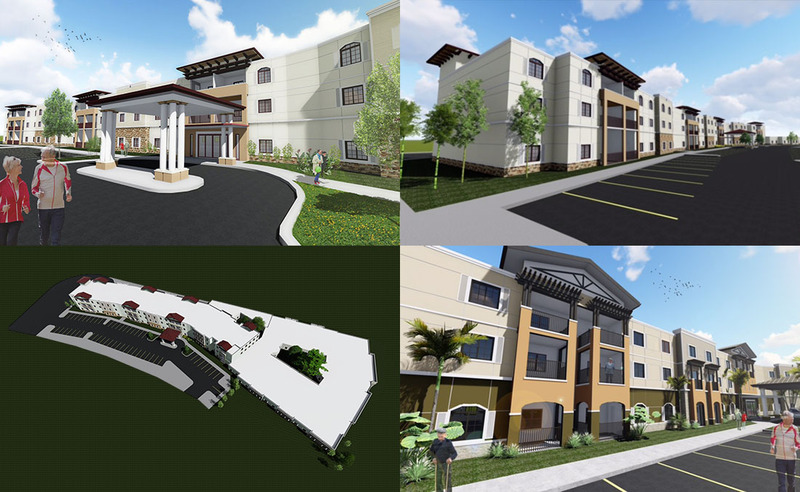 In December 2o15, Covelli Design Associates, Inc. of Boca Raton, Florida submitted an application to allow the construction of a congregate care facility at the corner of Via Flora and Lake Ida Road. In late April 2016, Covelli submitted all the updated paperwork. Review by the Zoning Commission could occur at early as August 2016. Covelli Design is requesting the confirmation for 77 units with 185 residents, but will only build 71 units with 170 residents at this time. They wish to reserve the right to build 6 more units with 15 residents at a future date. The Delray Villas PUD has 77 remaining units within the original PUD approval. Read the Justification letter below. 1. A building of one and three stories. 3. The traffic engineer estimates around 20 to 30 cars an hour during the day using the exit. 4. The three story part of the building is nearly 300 feet from the Delray Villa home to the south and extra side 35 foot planted buffer is proposed. 5. The three story section will be similar in size to The Atlantic at Delray Beach under-construction next door. Applicant: Michael Covelli of Covelli Design Associates, Inc.
Project Description provided by Michael Covelli of Covelli Design Associates, Inc. Fortress Ventures LLC (“Fortress” or the “Company”) is a premier real estate investment and development firm specializing in senior housing including assisted living and memory care. Fortress seeks best in class developments in select markets where it can offer its residents the best in class care and highly amenitized Class A communities. The Shores of Delray will focus on resident engagement and connectivity in a very unique, resort-like environment. Using a blend of technology and an innovative approach to providing care when it’s needed, The Shores of Delray will offer a distinctive experience for a new generation of seniors. Nestled within a residential area and adjacent to the new the Atlantic at Delray Beach residential development, the Shores of Delray will deliver a new standard for senior living in the Delray area. While The Shores of Delray will feature all of the amenities expected of today’s senior living communities, it also features some unexpected twists and one-of-a-kind offerings. The Wellness Center, for example, will feature advanced pneumatic fitness equipment designed for seniors, which have large touch-screen controls, and easy access for those with limited mobility. The 170-Room/Bed community will feature a salon, meeting and entertainment spaces, multiple dining venues, and courtyard views. Licensed as an assisted living community, The Shores of Delray will cater to seniors ranging from those who are completely independent, to those who need more care. There will be two separate and distinct neighborhoods within the community, one for Assisted Living and an adjacent Memory Care area dedicated to serving residents with varying levels of dementia. Using specialized technology and a focus on engaging each resident at their level of cognitive ability, the highly trained care team aims to give meaning and a high quality of life to residents and to their families. Residents will access their apartments using an advanced keyless entry system, eliminating the hassle and difficulty some seniors have with traditional keys. Proprietary wellness program also gives residents, their families, and their physicians a holistic picture of their well-being through the use of technology tools including activity trackers and in-room monitoring systems, which learn each resident’s routine and patterns and can report anomalies and trends. The community’s unique approach also uses technology to improve residents’ quality of life, by delivering care more efficiently and with more accountability. The community will utilize an integrated smart care platform which creates an entirely digital environment; it integrates communication, medication management, electronic health records, and resident care plans on a single device in the hands of each care team member. Physicians and pharmacists will have instant access to real time analysis of a resident’s complete health picture, creating a more holistic approach to care. On behalf of the Applicant, F. P. Dino, Inc., Covelli Design Associates, Inc. has prepared this application for a Development Order Amendment for the 5.63 acre property located on the southeast corner of the intersection of Lake Ida Road and Via Flora. The subject property, known as Delray Villas Civic Pod (Delray Villas), is a vacant site with 77 dwelling units assigned to the parcel in the Planned Development Master Plan. The request is to establish a congregate living facility (requested use) and to convert the 77 dwelling units to 185 beds by modifying the Master Plan to reflect the CLF use. The site plan shows current utilization of 71 units for a total of 170 beds with the remaining (as per the master plan) 6 units which equals 15 beds for future expansion of the congregate living facility at a later date if needed. The Delray Villas Civic Pod is located at the southeast corner of Lake Ida Road and Via Flora. The property is 5.63 acres in size and is currently vacant. In 1975, Resolution No. R-75-0863 was approved establishing the Planned Unit Development. Subsequently Resolution No. R-2001-0149 was approved to permit a Type III congregate living facility on the parcel. The conversion of the 77 units equaled 185 beds. In 2004, as per Status Report No. SR 1975-151C, resolution No. R-2004-1636 revoked the Development Order Amendment that previously granted Petition No. 1975-151C, which was adopted by Resolution No. R-2001-0149 for a congregate living facility. The reason the congregate living facility use was revoked was because in 2003 Ordinance 2003-013 was adopted which required an updated traffic study to determine if Resolution R-2001-0149 met the Traffic Performance Standards. No updated traffic study was prepared or submitted. No request for extension was submitted. Therefore a recommendation to revoke the use was initiated and adopted. In looking at documents in the County files related to the revocation of the CLF use by Resolution No. R-2004-1636, it is noted that the Master Plan was not modified in conjunction with the adoption of Resolution No. R-2004-1636 to delete the CLF designation. The current Master Plan on file reflects the 77 dwelling units and the conversion of those units to 185 beds. The Master plan should have been modified to only show the 77 dwelling units as the revocation was only for the CLF use which was approved and adopted by Resolution No. R-2001-0149. The approval of the Petition 75-151 established the PUD with a future land use designation of High Residential (HR-8). The Delray Villas Civic Pod is located at the southeast intersection of Lake Ida Road and Via Flora. The site is 5.63 acres and is referred to on the Master Plan as pod D-1. Pod D-1 was the original civic site for the PUD. The site currently has 77 dwelling units assigned to the parcel in the Master Plan as explained in the section above. The property adjacent to and on all sides of the site are designated HR-8 with the exception of the parcel to the southeast which is designated LR-1. The property adjacent to the south property line is developed as single family residences. To the west and across Via Flora the property is developed as Town homes and patio homes. There is one vacant building pad site located at the southwest corner of the intersection of Via Flora and Arbol Drive. Adjacent to the north is LWDD Canal L-32 and Lake Ida Road is north of the canal. The property on the north side of Lake Ida Road is developed as town homes. The current use of the property adjacent and east of the site is agricultural/ nursery with a current development plan for 346 multi-family units proposed. As listed above in the Project History section, Resolution No. R-2001-0149 was approved to permit a Type III congregate living facility on the Delray Villas Civic Pod. 77 units were assigned to Pod D-1 on the Master Plan. The approval of Resolution No. R-2001-0149 included a conversion of the 77 units equal to 185 beds. In 2004, as per Status Report No. SR 1975-151C, resolution No. R-2004-1636 revoked the Development Order Amendment that previously granted Petition No. 1975-151C, which was adopted by Resolution No. R-2001-0149 for a congregate living facility. If the owner at the time (not the current owner) would have provided an updated traffic study as requested use for a CLF would not have been revoked. Consistency with the Plan – The proposed use or amendment is consistent with the HR-8 land use designation and the purposes, goals, objectives and policies of the Comprehensive Plan, including standards for building and structural intensities and densities, and intensities of use. The requested use as Congregate Living Facilities is consistent and is permitted in all future land use designations. Consistency with the Code – The proposed use as a CLF complies with all applicable standards and provisions of this Code for use, layout, function, and general development characteristics. The proposed use also complies with all applicable portions of Article 2.B.2.B 1-7 STANDARDS. The proposed use is not in conflict with any portion of this Code, and is consistent with the stated purpose and intent of this Code. Compatibility with Surrounding Uses – The proposed use is compatible and generally consistent with the uses and character of the land surrounding and surrounding zoning districts in the vicinity of the land proposed for development. The proposed CLF is a low impact residential use that is within a residential area consisting of single family, townhomes, and patio homes. Design Minimizes Environmental Impact – The proposed use and design minimizes environmental impacts, including, but not limited to, water, air, storm water management, wildlife, vegetation, wetlands and the natural functioning of the environment. The site was previously cleared and does not support any significant native vegetation. Development Patterns – The proposed use will result in a logical, orderly and timely development pattern. 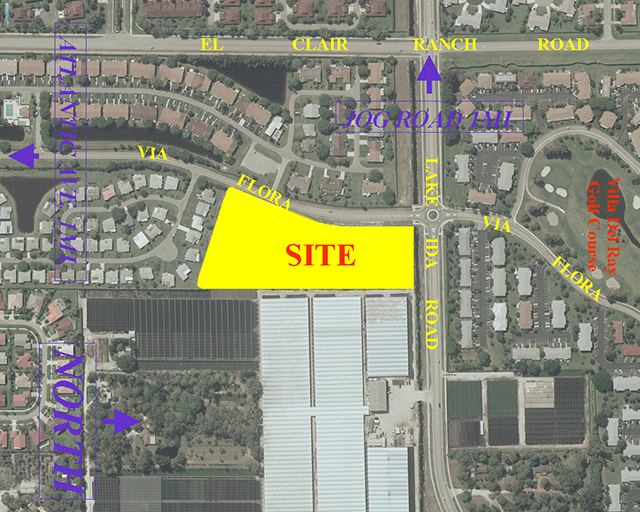 The site is within a built out PUD with the exception of the subject site and a vacant building pad located at the southwest corner of the intersection of Via Flora and Arbol Drive. The Delray Villas Civic Pod is the only completely unbuilt Pod remaining for development. The proposed use is consistent with the surrounding residential uses and is a permitted use within a residential PUD. Adequate Public Facilities – The proposed amendment complies with Art. 2.F, Concurrency. Adequate facilities are available to service the proposed use as a CLF due to the fact that the PUD is almost built out at a density below the maximum permitted density. Changed Conditions or Circumstances – There are demonstrated changed conditions or circumstances that necessitate a modification. As stated in the project history section above, Resolution No. R-2001-0149 was approved to permit a Type III congregate living facility on the Delray Villas Civic Pod. 77 units were assigned to Pod D-1 on the master Plan. The approval of Resolution No. R-2001-0149 included a conversion of the 77 units equal to 185 beds. In 2004, as per Status Report No. SR 1975-151C, resolution No. R-2004-1636 revoked the Development Order Amendment that previously granted Petition No. 1975-151C, which was adopted by Resolution No. R-2001-0149 for a congregate living facility. The current request is to acquire approvals again for 185 beds to be utilized for a congregate living facility. No hazardous wastes or airborne pollutants will be generated by the proposed project. Handling of any medical waste resulting from caregiving will be disposed of by contract with an authorized medical waste disposal contractor.